A cross shines with sterling splendor in a design by Nyoman Rena. The stylized cross pendant is crafted by hand and centers a leather braided cord. 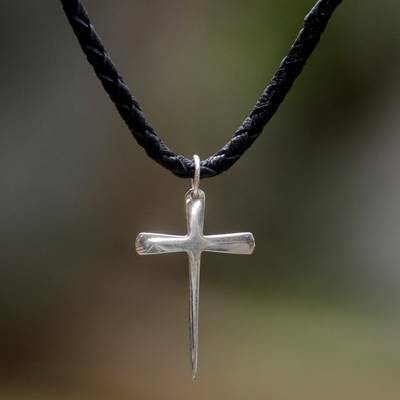 You can find men's sterling silver cross necklace 'Holy Sacrifice' by Nyoman Rena in jewelry categories such as Cross Necklaces, No Stone Necklaces, Silver Necklaces, Sterling Silver Necklaces, Leather Necklaces, Pendant Necklaces and Cord Necklaces. Enjoy exploring these sections for other Novica treasures. "This is a perfect simplistic cross"
I wanted a sterling silver cross necklace but was looking for something different. This cross is elegant and just the right size. The braided black leather necklace is also great looking and complements the cross nicely. I wear it every day and highly recommend it. "Simple design but beautiful statement"
The Holy Sacrifice has a nice design. It looks great. Good job Nyoman Rena! "My son loved this necklace." My son loved this necklace. "Holy Sacrifice sterling silver cross necklace"
This necklace is wickedly attractive! "I will ware this forever. " I just love this neckless. I wanted something hand made, not punched out by a machine. Beautifully crafted piece of men's jewelry - simple but strong. High quality and very pleased with this purchase. Thanks Nyoman.